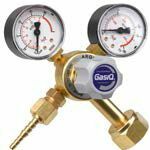 GasIQ Argon-Mix Mig Tig 2 Gauge Regulator Discounts Apply ! GasIQ Minex has been specially developed for outlets supplying small to medium quantities of gas for gas shielded welding. Minex is an excellent low-cost alternative for gas shielded welding in small workshops or for hobbyists. Minex is supplied with hose connections for hoses with 5.0 and 6.3 mm internal diameter. (The cylinder nut and tail will be changed to suit your needs on request).